Teaching is one of the most valuable, yet one of the least appreciated occupations in this country. With stagnant wages and increasing health premiums, being an educator is steadily becoming a more unlivable career. Though there are overwhelming obstacles in the education system and a clear need for reform, teachers currently taking action through district-wide strikes are now being threatened with a six-month jail sentence. In a bill introduced Friday, Colorado districts would punish teachers participating in the April 27 walk-out with a fee of $500 per day, along with a possible six months behind bars. Closing several school districts in Colorado, including Denver Public Schools, the impact of the strike would be immense, but that’s exactly what strike organizers hope for. With hundreds of thousands of students out of school for possibly weeks, lawmakers would be forced to acknowledge the gaping flaws in state education spending. Currently, Colorado is ranked 46th in average teacher salary and spends, per child, $2,700 less than the national average. Besides those directly participating in the protest, the proposal targets anyone, “directly or indirectly inducing, instigating, encouraging, authorizing, ratifying or participating in a strike against any public school employer.” The clear motivation is to silence educators and students being blatantly passed over by the state’s public school system, directly cutting off their power to even support those seeking reform. Though Colorado is one of the worst states when it comes to funding for education, the problem spans from coast to coast. According to the 2015 U.S. Census Bureau, in 29 states funding for schools per student decreased from what it was in 2008. It’s no surprise that educators are taking a stand and forcing state and local politicians to finally acknowledge the staggering disparities. Besides Colorado, strikes have been organized in West Virginia, Oklahoma and Arizona over the past few weeks, some ending in concrete, positive change. After a nine-day walk-out, legislators in Oklahoma passed a bill to raise teachers’ salaries $6,000 on average and restore education funding by $50 million. Two weeks into a walk-out in West Virginia, the state justice announced a 5 percent pay raise within the year. Though the bill was resisted in the Senate, it eventually passed nine days after schools shut down. 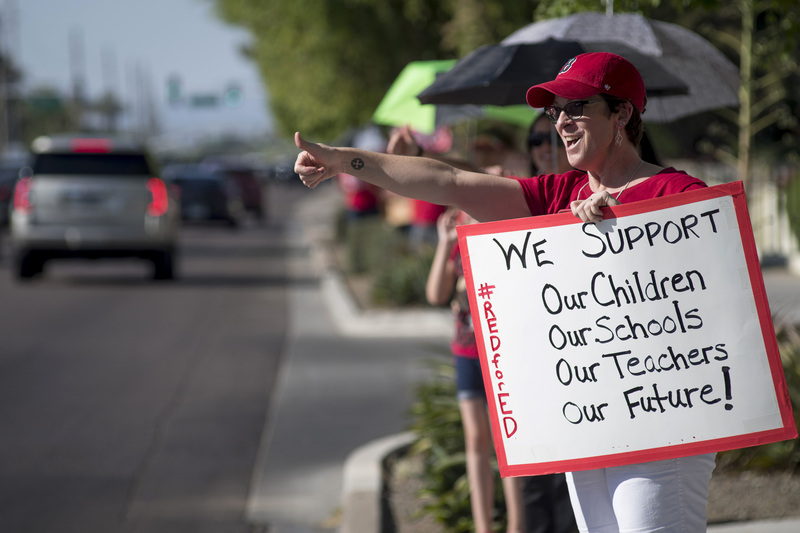 Arizona teachers demanded reform with a walk-out April 26, closing at least 100 public and charter schools. With successes in Oklahoma and West Virginia, the Colorado walk-out should make similar progress, but the proposed bill strips teachers of their power. With no opportunity to protest safely, Colorado teachers will not be able to have their voices heard by lawmakers and see substantial change in state spending. Though the bill has not passed in Colorado yet, the cruel force behind it perfectly captures the venomous environment public school teachers are subjected to year after year. To see how your local teachers are affected, visit: https://www.vox.com/ and check the teacher salary underpaid database for a state by state breakdown. Extend your support to those fighting for the health of our nation’s education, and acknowledge what’s happening to teachers in your own public school district. The future literally depends on it.